After a great morning highway cleanup yesterday, I enjoyed the most rewarding conditions at Kahana I can remember in a while. McStalker was up first, and he said he thought it was one of those days where we could fly above the clouds as they formed below us. He was right! 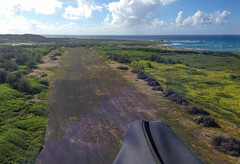 I joined him at 2,900 feet above Puu Piei and from there I flew my best and highest scoring Kahana cross country flight ever, from Mokolii to the old Kahuku Point Airfield. Just shy of Kuilima Golf Course! That airfield has a colorful history. It once extended from what is now Kuilima Golf Course down to Kahuku village. The short section of paved airstrip I landed on is at the Kuilima golf course end. The airfield was developed and used by the army in the 1940s before it was closed at the end of the decade. Then in the 1960s the airstrip became a popular spot for drag racing. Dorothy's mom and dad raced cars there as teenagers shortly after they met! In the 1970s there was also a nudist colony in that area. I took a long and leisurely route to get there. I was lucky to get high early and get across the bay in the other direction first, and I'm sorry no one else was able to join me. I could hear the guys over the radio back at Kahana, and I could also hear Dave and Frank at Makapuu talking about the dolphins at Sea Life Park. I got super high everywhere, in nice mellow ridge lift. I reached 2,700 feet at Kualoa, and then tagged Mokolii at 2,200 feet. That's when Reaper called me from the helm of a boatload of kids just before they landed at Secret Beach. I flew over the State Farm Fair and then back to Kaaawa, where I got up to 2,900 feet before heading back to Kahana to see what the guys were up to. It turns out Duck had given up on joining me, and had blazed a trail north to Hukilau. He called on the phone to say he needed a ride, but he'd wait if I was inclined to go that way. I was! I had visions of landing at Kahuku Golf Course like I did on Monday. I tried to get Thom to come, but he said he was already tired and he knew his limits. Hmmm. I was tired too, but I guess I don't know my limits! I got to about 2,800 feet above Puu Piei and waited out quite a few enormous cloud banks before finally turning left. Getting high was not going to be hard. Dodging these big grey battleships was the tricky part! Gaza turned downrange before I did, and he made a beeline for the Punaluu condos where he is staying. I finally had the opening in the clouds I wanted, and made that notorious left turn. Jim tagged along and I was glad for the company. Jim and I worked the Punaluu ridge and dodged the clouds there, trying to get high safely to load up on ammunition for what is usually the longest glide of the flight. I was able to get just over 3,100 feet here, above most of the surrounding clouds, before heading out to the foot of the ridge and turning left again. I was set up for a nice outside line, which I always find gives me the best odds of making the golf course. I reached Pounders with about two grand, and there I was surprised to feel a nice thermal apparently baking off of the little bay there. I turned, and was rewarded with solid beeps. I kept turning, and even though I was now drifting into a deeper line, I was getting back up above cloudbase again, reaching around 2,500 feet behind Laie before turning back to my glide. Now I definitely had more options. I hedged my bets and cut a line behind my usual golf course landing zone, keeping it within reach as a backup plan. But I was 1,200 feet high there. Probably not quite enough to hit the next one unless I took a very inside tailwind line to reach the entrance of Turtle Bay at the highway. I really didn't relish a windy landing that far inland. So I played it safe and continued along the coastal route, flying over the marshes of the wildlife preserve and aiming for the nice clear airstrip I could see in the distance. I made it there with just enough height to fly to the end and turn for a very windy touchdown. I was a long mile from the highway, and I trudged out of there along the old nudist camp road. Thanks to Duck and Jim for the pickup and cold refreshment! After we got back to Kahana, we enjoyed a long debriefing session with many of the pilots who had flown all day in such great conditions. Thanks to Duck and Gaza for the refreshments. Roll call for the day: Five-0 Mike (and Ces), Jayson (and Natalie), Johnimo, Sandy, Thom, Woody, George, JK, Alex, McStalker, Sharky, Duck (and Ginger), Larry Mac, Hilo Ken, Gaza, Jim, Maui Kai, Solar Jeff, and probably a few more than I'm forgetting. Wow! Great flight, Alex! Couldn't get more than 2500 ' and fell short on all the crossing attempts. Gotta learn to milk it up there and conserve it on glide better, I suppose. One day I'll figure it out... You're great for showing us all what can be done so we don't just settle for a mediocrity. Keep charging! One day you'll have a wingman landing with you. The airstrip pic is awesome. Gotta be the first time ever landing your craft on an actual airstrip. The winds had to be strong down there. I used to joke about the turn left club but I am finding a lot of things I can learn for down wind legs. Lines to follow and proper bar pressure. I learn something new every time. I guess I just have to fly MORE! Oh add Sebastian and Drew to the list that day. Sebastian got his first 2 flights. Drew is killing it and will be passing us soon. Congrats. It' Time to Fly Get Your Gear and Go!!! Remember to turn left high and pick the best line.